Very hard to find now in this finish and in excellent condition. Very little use but checked in full working order. Boxed. 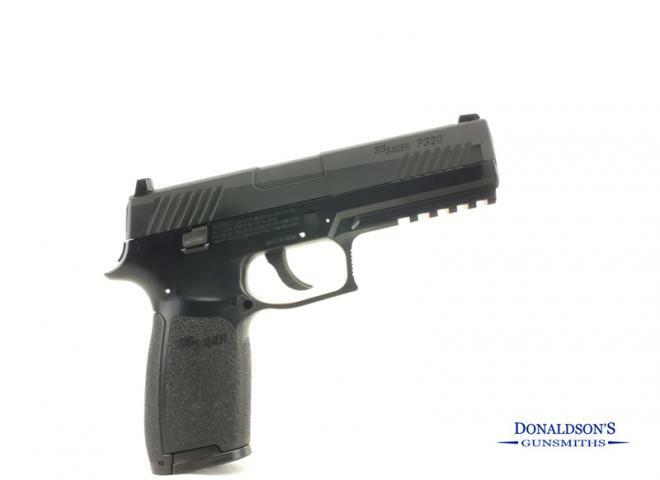 Note: this is the Cybergun licensed replica, not manufactured by Sig-Sauer like the smaller P226's. Sig Sauer M17 Coyote Tan Finish, .177 Pellet, 20 shot magazine and fully field strip able. 01223837977. Replica of the US Army's M17 Pistol. Fully Field Strippable. BASED ON THE U.S ARMY M17 SERVICE PISTOL. Made by Sig Sauer, the M17 is the latest entry in their prestigious air pistol range. Made to the same high standards as the live firing version, the M17 carries an air of authenticity not usually found in pellet firing air pistols. This BB firing pistol from Sig Sauer has been designed by Max Michel jr who is Sig Sauers team captain and world speed shooting champion, and includes all of the features that the best of shooters demand to make them the best. This new Sig Sauer CO2 fires lead air gun pellets and is of superb quality, mainly due to the fact that they are produced by Sig Sauer, meaning this pistol not only shoots the business, but looks the business. A very Hard to find P250 with a OD Green lower. "molan labe" (come and take them ) on the top slide. Full metal chassis, blowback top slide with 16 shot metal bb magazine. An excellent air pistol from Sig Sauer. Features a full metal body, blowback top slide, double sided 16 shot .177 pellet magazine and one of the easiest systems for inserting and removing co2 capsules. Sig Sauer P320. Features a huge 30 shot capacity pellet magazine and blowback top slide.